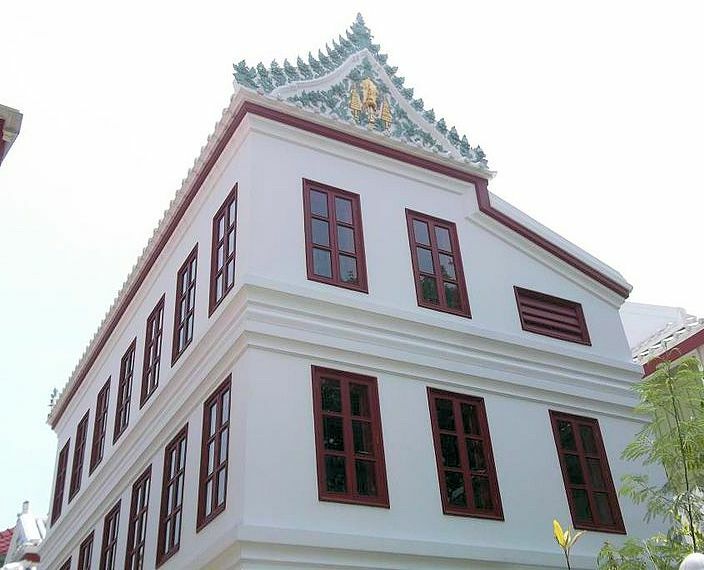 Neubau des Wat Chalong (วัดฉลอง = Wat Chaiyataram - วัดไชยธาราราม) in Phuket (ภูเก็ต). Erhöhung der Steuern auf Hauspfähle und auf Boote. Der König befiehlt, dass keine Dschunken mehr gebaut werden und dass staatliche Handelsschiffe ab jetzt nach europäischem Muster gebaut werden müssen. Ein Staatsbediensteter, der sich Leibeigene eines Departments für seinen Privatgebrauch angeeignet hatte, wird hingerichtet. 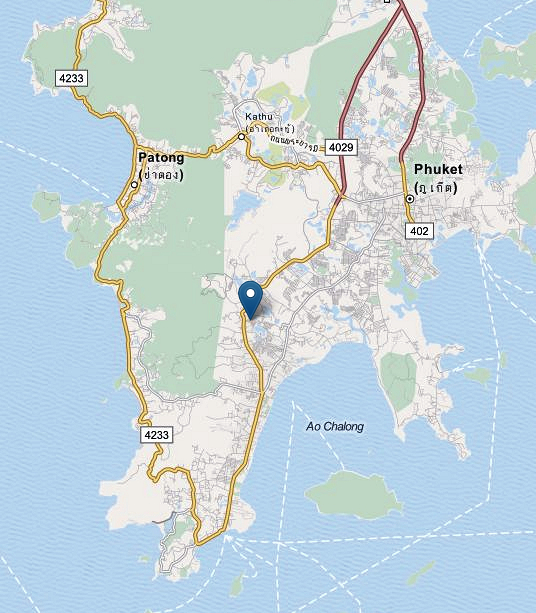 Bau des 54 km langen Khlong Saen Saep (คลองแสนแสบ) von Bangkok nach Bang Khanak (บางขนาก). Baukosten: 76.500 Baht. Der US-Baptistenmissionar Dan Beach Bradley (1804 - 1873) amputiert einem buddhistischen Mönch den Arm, der diesem bei einem Fest durch eine explodierende Kanone verletzt worden war. Dies ist die erste westliche chirurgische Operation in Siam. 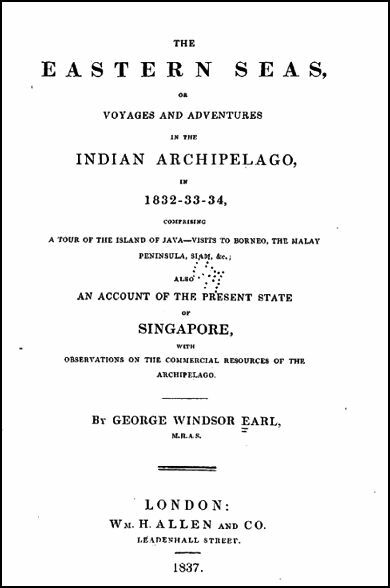 Earl, George Windsor <1813-1865>: The Eastern seas; or, Voyages and adventures in the Indian Archipelago, in 1832-33-34 : comprising a tour of the island of Java, visits to Borneo, the Malay Peninsula, Siam &c., also an account of the present state of Singapore with observations on the commercial resources of th Archipelago. -- London : Allen, 1837. -- 451 S ; 22 cm. "The men are generally morose and unamiable, but the women are often lively and cheerful, many of them being very good-looking, although the extraordinary fashion of dressing the hair does not improve their personal appearance. The men who are engaged in their usually inglorious campaigns, acquire habits of idleness which are never afterwards corrected, and consequently the support of these drones, and of the enormous mass of priesthood, falls entirely on the women. The body of Talapoins or priests is enormously disproportioned to the rest of the inhabitants. In Bankok alone their numbers exceed thirty thousand. Like lilies of the valley " they toil not, neither do they spin," but are idle consumers of the produce of the soil. They do not even cook their own provisions, not being permitted to do so by their creed, but the younger members of the community go from house to house to collect the viands which are bountifully supplied by the people." "The Chinese, of whom there are about half a million in Siam, engross all the mechanical employments. A considerable proportion of these people have taken up their abode in Bangkok, where they are engaged in building junks, and making quallies or iron pans, which are exported in large quantities to all parts of eastern India. Timber is dear in China; therefore the junks which are employed in foreign trade are generally built in countries where wood is more abundant. It is supposed that a junk can be built cheaper at Bangkok than at any place in India, which may account for the large numbers of Chinese employed there in ship-building. Were they united, they might attain great political power, but the natives of different provinces are strongly opposed to each other, as much so. indeed, as if they belonged to rival nations. There are also considerable bodies of Burmese, Cambodians, and Cochin Chinese, settled at Bangkok, all of whom are in every respect superior to the Siamese. To these may be added no small number of Malays, but they are slaves, and are generally scattered over the interior, at the plantations of the nobles to whom they belong." 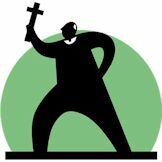 "Many native Christians are to be found at Bangkok, probably about five or six hundred. These people are either descendants of the Portuguese who formerly traded on the coast, or converts to the Jesuits of the Propaganda mission, several of whom are established in Siam. The Christians inhabit a portion of the town near the factory, called Santa Cruz, the greater part of which was burned to the ground a short time before my arrival. They are despised both by the Europeans and the natives, and certainly not without cause: for they do no credit to any country which might own them. How the majority of these people contrive to live, it is impossible to say, but appearances are strongly against the supposition that they earn a subsistence by honest occupations. Their communication with Europeans has enabled them to acquire a more extensive degree of knowledge than the natives, and some of them are consequently employed as interpreters and pilots, the captain of the port also belonging to this class. Their acquirements, however, are not always turned to a worthy use, and among other accomplishments of a very dubious nature, they are said to be complete adepts in pig-stealing, so much so, that a grunter can be whipped up and carried off without the least noise, and even without the animal itself being perfectly aware of the circumstance. Many a wretched Chinaman, who has been watching for weeks the gradual developement of the sides and haunches of a fattening porker, awakes some morning, perhaps after dreaming of the feast he expects to enjoy in the course of a few days, and finds to his utter dismay that the pig has been abstracted from the sty during the night." "The Malay pirates absolutely swarm in the neighbourhood of Singapore, the numerous islands in the vicinity, the intersecting channels of which are known only to themselves, affording them a snug retreat, whence they can pounce upon the defenceless native traders, and drag them into their lairs to plunder them at their leisure. Square-rigged vessels are generally allowed to pass unmolested, for the pirates, who are as cowardly as they are cruel, rarely attack craft of this description, unless they have received authentic information from their spies at Singapore that they may be taken with facility. The system of piracy is perfect in its nature, more so even than that which formerly obtained among the Buccaneers of America. A petty chief of one of the Malay states, who has either been ruined by gambling, or is desirous to improve his fortune, collects under his banner as many restless spirits as be can muster, and sails for one of the most retired islands in the neighbourhood of Singapore. Here he erects a village as a depôt for slaves and plunder, and then lies in wait with his armed prahus, near the frequented waters, for the native traders passing to and from the British settlement. Should the chief be eminently successful, he soon gains a large accession to his force, and his village increases to a small town, while his fleet of prahus becomes sufficiently numerous to be subdivided into several squadrons, which cruise in the various straits and channels. The pirates generally sail in fleets of from three to twenty prahus. These are armed with guns, large and small, and each prahu carries from fifteen to forty men. The vessels which they succeed in capturing are brought to the settlement, where they are plundered and afterwards burnt; and the goods are taken for sale to Singapore or New Harbour, in prahus of their own, which arc fitted up to resemble traders. The unfortunate natives who compose the crews of the captured prahus, are carried to Lingin, or to the opposite coast of Sumatra, where they are sold to the Malays, to cultivate the pepper plantations in the interior. A glance at the Singapore journals will show to what an extent the system of piracy prevails; and it must be remembered that the instances with which their columns teem, form only a small proportion of the number which actually occur, as it rarely happens that any of the sufferers escape to tell the tale. The detrimental effect that this predatory warfare must produce on the commerce of Singapore is obvious, and there can be no doubt that thousands of the natives of the islands, who would otherwise visit the settlement for the disposal of the produce of their industry, are now deterred from so doing by a dread of encountering these remorseless wretches. In mercy, therefore, to the native traders who visit the settlement on the supposition that they will at least be free from violence when within sight of the British flag, some measures should be taken to put an end to the system. I regret the necessity which obliges me to repeat, that nothing but the most rigorous measures, even to the utter annihilation of those who may be caught in the fact, will tend to check the evil; for the pirates having long been permitted to commit their murders and robberies with impunity, now consider themselves to be almost invincible, and therefore require some very severe lessons to bring them to their senses. The frightful acts daily committed, however, will never be entirely suppressed until those Malay chiefs who encourage the pirates, by affording them assistance and protection, receive some substantial proof that such practices will not be permitted with impunity. To show how very easily the banditti of these seas may be deterred from their aggressions, I will mention a single case in point. A few years ago an American merchant ship was attacked and taken by the Malay inhabitants of Qualla Battu or the west coast of Sumatra. When this circumstance became known in the United States, the President, with a promptitude worthy of the chief magistrate of a great commercial nation, immediately despatched a frigate to chastise the offenders, and Qualla Battu was attacked and burnt. This act of retribution has produced a very beneficial effect, since, although many American ships annually resort to the coast, not a single instance has occurred of one of them being attacked or molested. Severe punishments inflicted upon those who have been guilty of piratical offences, would be an act of mercy to the Malays themselves, for it would induce many to direct their attention to commerce, who, but for this wholesome fear, would be tempted to join the marauders, on account of the large profits which they acquire in the attack of defenceless traders, almost without danger in the encounter. The Malay pirates, although they fight hard when driven to extremity, are, in reality, great cowards; and a single defeat will so effectually damp their ardour, that, after having sustained it, a long time, will elapse before they venture to show themselves again. In 1833, his Majesty’s ship Harrier, the only ship of war which has lately performed any signal service in the suppression of piracy, destroyed a haunt on the Carimons, (a group of islands near Singapore, ) and no act of aggression was committed for several weeks afterwards." 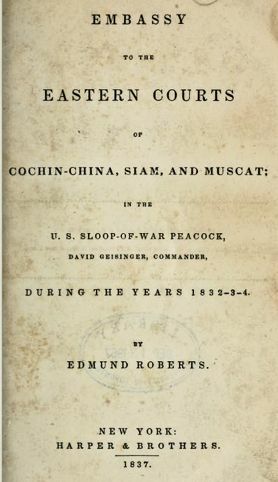 Roberts, Edmund <1784 - 1836>: Embassy to the eastern courts of Cochin-China, Siam, ans Muscat; in the U. S. sloop-of-war Peacock, David Geisinger, Commander, during the years 1832-3-4. -- New York : Harper, 1837. -- 432 S.
"The Siamese possess no ships of war, but they have an immense number (probably not less than five hundred) of war-canoes; some of them being over a hundred feet in length, and made of a single teak-tree: they have also, probably, fifty or sixty vessels, having two or three masts, using fore and aft sails, and carrying from three to eight brass guns: the largest do not exceed a hundred tons’ burden: these are neatly and strongly built, and many of them are even elegant models. 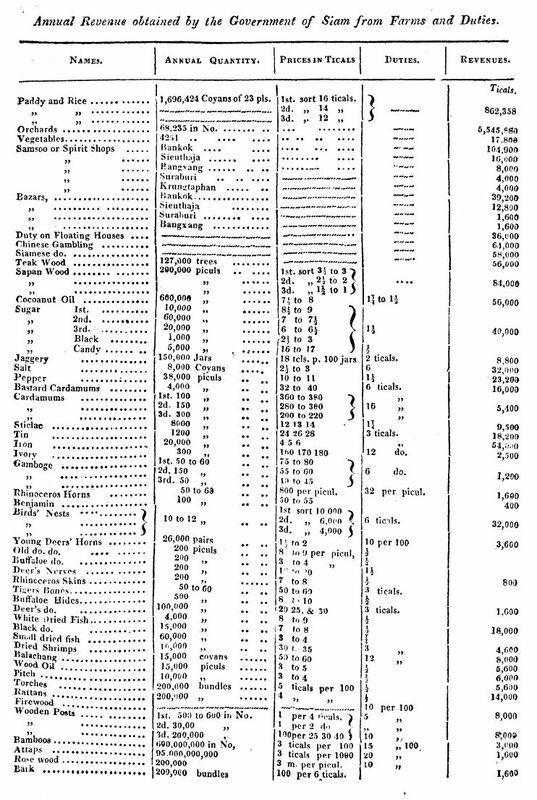 The whole number of mariners employed in foreign and coasting voyages, may be fairly estimated as amounting to not less than thirteen thousand." 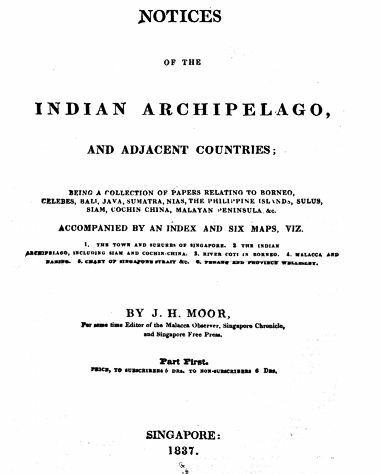 Moor, J. H.: Notices of the Indian Archipelago and adjacent countries: being a collection of papers relating to Borneo, Celebes, Bali, Java, Sumatra, Nias, the Philippine Islands, Sulus, Siam, Cochin China, Malayan peninsula, etc. -- Singapore, 1837. -- 410 S. : Ill. ; 22 cm. "On the arrival of the writer in Siam in September 1831, the Praklang [พระคลัง] was very anxious to know if the English would assist the Malays or not He was told it was quite evident the English were assisting the Siamese, having sent ships of war to blockade the Quedah [قدح] river. He then asked what was the general opinion on the war, who, did the English at Singapore say, would gain the day. The writer said that to judge from what had already taken place, the Malays would conquer, unless more men were sent from Bangkok. This the Praklang answered would not be done, as the king had ordered the rajah of Ligor [Nakhon Si Thammarat - นครศรีธรรมราช] to take the country, and the latter had said he was able enough to accomplish that without any assistance from Siam, and if he did not do all he professed, the king would be much displeased, and perhaps disgrace him. 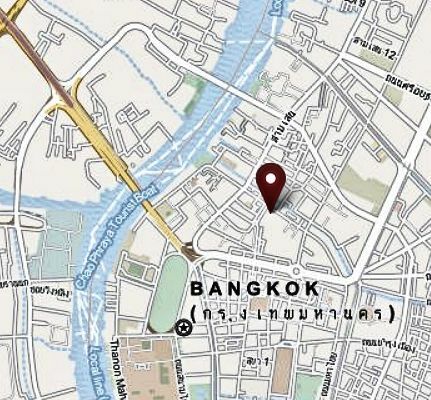 About this time also, an insurrection broke out at Patani [ڤتاني], Jella and Jarim, when the Siamese settlement of Singora [Songkhla - สงขลา] was attacked. Letters arrived from the governor of Singora demanding assistance and great preparations were made for his defence. It was said that 40 war-boats and 12,000 men under three phyas [พระยา] were sent to Singora. This is the number given out, but the actual force sent was much less. Previous to this the king advanced the Praklang to the rank and title of Chou phya kalahom [เจ้าพระยากลาโหม]. This elevation did not much please the Praklang. He was greatly afraid of losing his more lucrative situation of Praklang, and when the king offered him this new dignity he said he could not leave the office of Praklang, because the day his father became Kalahom, he died, and he was certain the same fate awaited him. The king, to please his favourite, said he might continue to be Praklang, and become Kalahom also, which was just the very thing the sly fox wanted. This is the first instance of an occurrence of that nature happening in Siam. 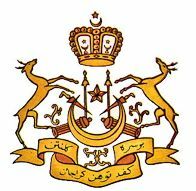 The Malayan states of Patani [ڤتاني], Calantan [Kelantan - كلنتن] and the other smaller states of Jella and Jarim began to assume a hostile appearance towards Siam, and refused to be taxed and have their hands written on—(all the people belonging to the king of Siam are marked on the wrist) — besides having the mark of slavery put on their arms. The officer, who collected the tax, (a phra [พระ] of the second class,) by way of remunerating himself for his trouble, demanded three ticals a head. This was more than the poor people could pay, and those who could not pay, he flogged whether men, women or children. From this unauthorised act of oppression and cruelty arose the disturbance. When the second king heard of the misconduct of his officer, he ordered him to be seized and beheaded, without trial. The Praklang as Kalahom was ordered to proceed immediately to Singora and from thence to Patani, in order to put an end at once to the disturbance in that quarter. 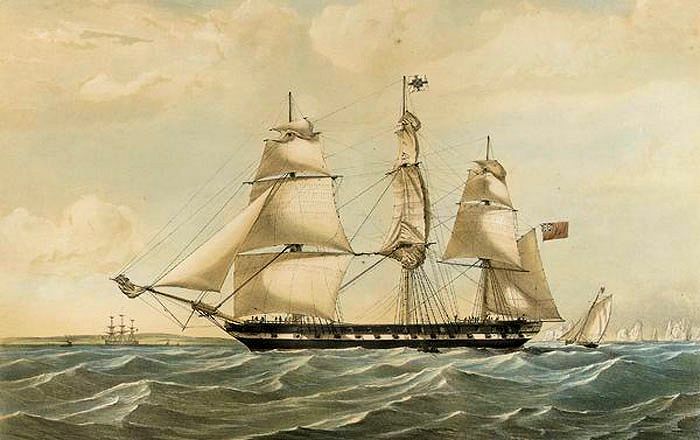 He sailed from Bangkok on the 17th of March 1832, in a war-boat with a fine gilt stern and gilt head, accompanied by about 18 more war-boats containing altogether about 3,000 men. The Praklang as Kalahom was invested with royal insignia in the shape of a pyramidical cap or crown, and went down the river in great state, with bands of music playing &c. His boat was pretty well crowded, having four of his wives, two of his sons, and his brother Poinat, with their servants and baggage ; besides as many men, or, as they called them, soldiers, as the vessel could hold. They had a very long passage along the coast, the old Praklang being such a coward that they were obliged to keep in shore all the way and anchor every night, so that it took 46 days from Bangkok to reach Singora. On the Praklang’s arrival there, he found the Malays had been already dispersed, and he had nothing left to perform, but to plunder the people, to do which, it may be certain, he did not lose so good an opportunity as then presented itself. 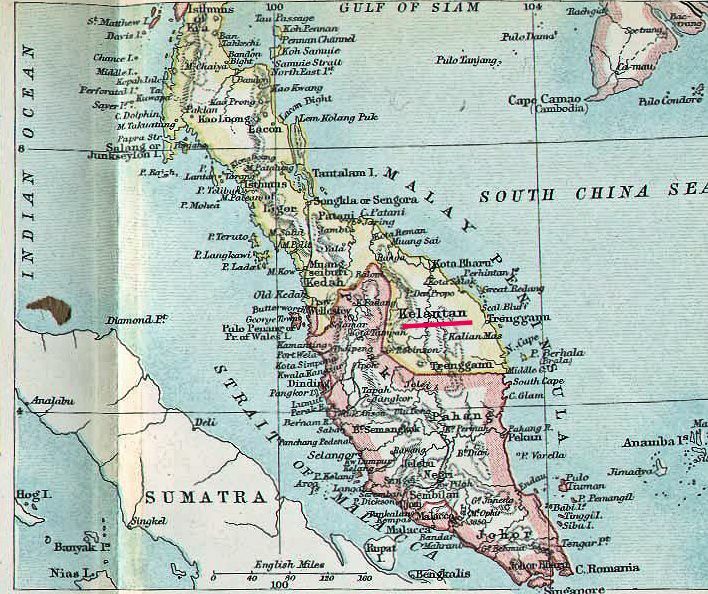 The rajah of Patani was reported to have fled to Calantan ; but the Praklang sent orders to the rajah of that place to deliver him up, promising that he should not be hurt. The rajah of Calantan caught and sent the rajah of Patani to the Praklang, who treated him well at first. By this time the Praklang had removed his head quarters to Patani, and employed his people in plundering in every direction. Not content with taking whatever the poor people possessed, they caught every person they could find, young and old, sick and healthy, promiscuously ; and not satisfied with capturing the unfortunate inhabitants of Patani, Jella and Jarim, they also carried off all the cattle, and burnt and cut down all the fruit trees that came in their way. The Praklang wrote several times to the rajah of Calantan, to come and visit him, but the latter always sent an excuse, saying he was very old, (which is the case.) After much negociation, the poor old man was obliged to pay, (notwithstanding his having delivered up the rajah of Patani,) to the king of Siam 30.000 Spanish dollars and ten catties of gold-dust; and to the Praklang, little by little as much more as he could collect in order to be allowed to retain possession of the country ! It is pretty certain, from the well-known character of the Praklang, that if he obtained one dollar for the king he secured three for himself. About the end of August, the Malays being quiet, and every thing settled to the satisfaction of the Praklang, he proposed returning to Bangkok with his principal spoils, viz : from four to five thousand prisoners, or slaves. Those miserable, wretched creatures were forced on board the small junks and war-boats, and were crowded together as thickly as they could be stowed, without any room being left for them to move. When they arrived at Bangkok and were landed on the banks of the river the sight they presented was most miserable, and the stench from their persons and the vessels, dreadful. One fourth were covered with the small pox. 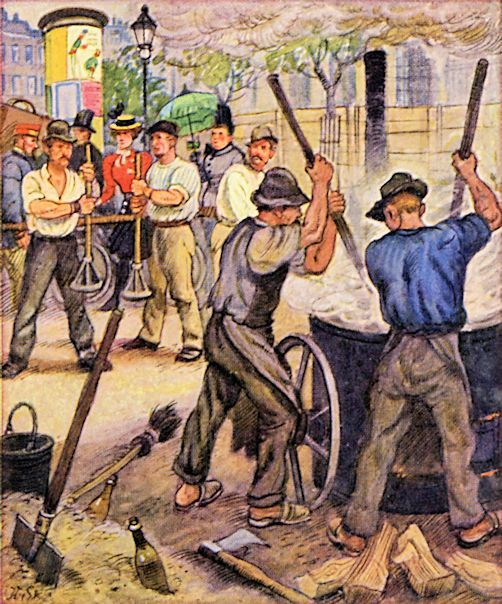 They were all placed, or huddled together, in one side of the building called the British Factory, and there the writer was an eye-witness of such distress and misery as would have rent even a heart of stone. An account of this may be seen in the Singapore Chronicle of the 22nd November 1832. The Praklang himself arrived on the 20th of September 1832 bringing with him the rajah of Patani and his family. The rajah was sent in chains to the king’s palace, where he is still kept, and his family were placed in another house with other prisoners of rank. The king was much pleased with all the Praklang had done and rewarded him with a present of 30 catties of silver, or 2,400 ticals,—to purchase playthings with—as the king said—sue arie lin" On the arrival of the rajah of Ligor a short time after, he also was rewarded with a similar present, and sent back immediately to Ligor there to remain until the time arrived for burning the body of the second king, on which occasion he would be expected to attend. The second king, or Wang Na [วังหน้า], had been troubled with dropsy for a long time previous to his death, which took place about the end of April or beginning of May 1832. He died poor, being of a liberal disposition. All he possessed he spent on his officers, and priests, and in building pagodas. He left several debts unsettled which the king paid off, who also took his officers into the government employ. The office of second king had been generally considered a sinecure though the emoluments attached to it were very considerable, viz: one- third of the revenue of the kingdom, and an allowance from the king of 1500 catties of silver annually to pay his officers. On the death of the second king, there were three or four expectants, particularly prince Cromma-mon-rak, and several other Crom-ma-mons; but the king, to put an end to all their expectations, created a new title namely Crom ma-luang, and invested four of the princes with it. At the same time he raised several of the inferior princes to a higher rank than they held before, thereby doing away with the title of second king altogether. The body of the second king was kept in state until the beginning of April, this year, when all the grand preparations for burning it were completed. The processions commenced about the first of that month and lasted during six or seven days, when the body was burnt, and most probably his ashes, as usual, have been made into a god. A painting, descriptive of the procession, could alone enable a person to form any idea of the scene, for no pen could describe it, it being impossible even to imagine names for the figures of the animals, griffins, nondescript monsters &c. which were drawn along on hurdles by large groups of men. The procession was somewhat similar to that which took place at the burning of the late first king, and which is partly described in Finlayson’s or Crawfurd’s work on Siam. The prince before whom Major Burney’s treaty was concluded, Com-ma- Sureen, died several years ago." "The king of Siam is by no means popular in his own country; he is very avaricious, his heart being set on no other object than making money. In one respect only he is liberal; that is, towards his priests and pagodas. He burdens the poor in order to give to lazy rogues of priests. The price of rice being high since the last inundation, as usual in such cases, the number of priests has increased, and grain is not yet sufficiently cheap to induce these fellows to leave off their affected holy calling, all being clothed and fed by the king and the poor ignorant people. 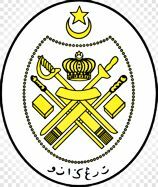 It will be a fortunate circumstance for the Malayan states of Calantan [Kelantan - كلنتن] and Tringanu [Terengganu - ترڠڬانو] if his majesty of Siam enters into a war with Cochin-China; otherwise the Siamese government will never remain contented until they have either obtained complete possession of those states, or impoverished them so much that they will not be worth taking. On his way to Siam recently, the writer called on and saw the Rajah of Tringanu, who was desirous that the former would settle at Calantan as a merchant, and as an inducement, held out the great prospects of making money. He said the Malays would not then be afraid of the Siamese ; he was told however, the Siamese could not interfere with either Calantan or Tringanu, but if the two Rajahs were simple enough to pay money when the king or any of his petty officers demanded it, the latter would be fools, were they not to accept what they got by merely asking. A copy of the treaty with Siam translated into the Malayan language, was given to the Rajah which pleased him much. He said his predecessor had obtained a copy, but it was lost in the late revolution. He further hinted he would like if the English would take possession of Calantan. When the writer arrived at Siam he informed the Praklang [พระคลัง] that this Rajah was very old and could pay no more money. The Praklang, it seems, had likewise sent an order, a short time previously, for the Rajah to work a tin mine, which he heard existed in the state of Calantan, and to send him 300 piculs [擔] of tin. The old Rajah was obliged to set to work under the direction of one or two Siamese, and to dig out this supposed tin ore ; but it proved to be lead, and only very little of that, as out of one picul of ore they obtained but one dollar weight of pure metal. The writer brought a sample of the lead to the Praklang, and informed him of the trouble the old Rajah had taken, and how poor the Siamese had made him by taking away all his gold and dollars and how they even wanted more, as if he could make money of stone. The Praklang was somewhat annoyed at these remarks, and said there was abundance of tin in the country, but the Malays were too lazy to work the mines. He asked who wanted more money from Calantan—and was informed that there were twenty men there demanding gold-dust, who had been sent either by himself or the Rajah of Ligor. He then asked why the Rajahs of Calantan and Tringanu had not sent up presents to assist in the burning of the second king ; and was told that they were then preparing topes, for that purpose, which were to sail a few days after the writer did. This information pleased both the king and Praklang much." Damen Conversations Lexikon / hrsg. von C. Herlossohn. -- Leipzig : Volckmar, 1834 - 1838. -- 10 Bde. "Siam, ein 12,000 Quadrat M. großes Königreich in Hinterindien (s. Ostindien), an Birma, Malacca und das chinesische Meer grenzend, größtentheils gebirgig, doch auch mit herrlichen, von schönen Flüssen, namentlich dem majestätischen Menam, durchschnittenen Ebenen, – ein blumen- und fruchtreicher, aber bei einer Bevölkerung von nur dritthalb Millionen Seelen, wenig angebauter Garten mit romantischen Felsenpartien, unter Indiens wundersamem, tiefblauem Himmel. Der herrschende Volksstamm sind die Siamesen, von kleiner Statur, kräftig gebaut, aber gänzlich der Grazie und Geschmeidigkeit entbehrend, durch welche sich andere Indier auszeichnen. Ihre Tracht ist ärmlich: sie besteht gewöhnlich in einem Stücke Seiden- oder Baumwollenzeug, das um die Hüfte drapirt wird, und die Beine unbedeckt läßt. Die Farbe der Kleidung ist braun; weiß bezeichnet die Trauer. Beide Geschlechter tragen weder Turban noch Mütze, und außerordentlich lange Nägel und schwarze Zähne gelten auch bei ihnen, wie bei den Chinesen, für eine vorzügliche Schönheit. Die Hautfarbe ist meist lichtbraun und bei den Frauen der höhern Stände wird der Körper durch den Gebrauch eines glänzend gelben Waschwassers oft goldfarbig. Der Siamese hat nur eine rechtmäßige Gattin, darf aber so viele Nebenweiber halten, als er ernähren kann; auch hat er die Erlaubniß, die letzteren, sowie die Kinder, zu verkaufen oder zu verschenken. Die Hauptstadt des Landes und Residenz eines grausam-despotischen Königs, der den Titel »Herr der weißen Elephanten« führt, heißt Bankok." Stapellauf der Blackwall-Fregatte Seringapatam. Solche Schiffe sind bis nach 1870 auf den Routen nach Indien und Ostasien im Einsatz. Der amerikanische Schmied John Deere (1804 - 1886) erfindet den ersten selbstreinigenden Stahlpflug. Er ist besonders für schwere Böden geeignet. Man erkennt, dass sich Asphalt als Straßenbelag eignet. Vajirañāṇo Bhikkhu (วชิรญาโณ ภิกขุ, 1804 - 1868), der künftige Rama IV., zieht mit großem Pomp zu seinem neu erbauten Abt-Gebäude (พระตำหนักปั้นหยา) im Wat Bowonniwet (วัดบวรนิเวศวิหาร). Vajirañāṇo durfte zuvor im Palast des verstorbenen Uparat Einrichtungsgegenstände und wertvolle Manuskripte für seine Mönchswohnung auswählen. "The town of Zimmé, or Kiang Maí [เชียงใหม่], as it is called by the Shans [တႆး], is in 18° 47" north latitude, and about 99° 20" east longitude. Water boils at 210 ½° Fahrenheit. It stands in a plain on the right bank of the Me Ping [แม่น้ำปิง]. On its eastern side flows the river, having fields between it and the town, and likewise beyond it. To the northward and eastward is a large swamp or tank; to the northward and westward, broken ground and gardens; to the westward, the old Burmese fort and fields; and to the southward fields bounded by the river. The north-east angle of the outer fort approaches within 300 yards of the river, which continues its course from this point, increasing its distance gradually to about three-quarters of a mile, and then sweeps round, at the distance of a mile-and-a-half, parallel to the southern face of the town. The river is now fordable in several places near the town, there not being above 3½ feet of water in it; but a good wooden bridge, of 200 yards long, is thrown across it near the north-east angle of the fort, over which bullocks and carts pass. During the rains this is the only way across, and is on the high road to Labong [Lamphun / หละปูน / ลำพูน]. 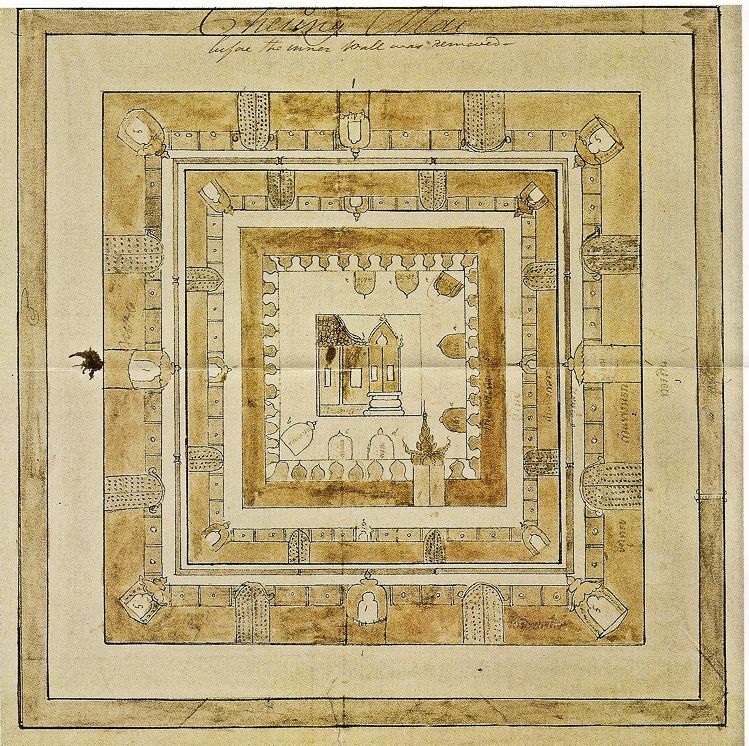 The inner town, where the Tsóbua [เจ้าฟ้า] and principal chiefs reside, is a square, each face being about 2,050 paces long, with gateways in the middle, except on the southern face, where there are two, at about 560 paces from the angles; the walls are about 22 feet high and 3½ feet broad at the top, having large bastions at the angles, and the gates covered by another in front of them, with a small bastion at their sides. These have embrasures for guns, some high up and some low down. There are also some embrasures here and there along the curtain. The whole is surrounded by a broad ditch of about 50 feet wide, filled by the springs from the hills, which enter it at the north-western angle; its depth varies. In some places it must be 15 feet, and at others, about nine feet. It is a formidable place to the undisciplined forces of their neighbours, but a few shots from British guns would soon bring the wall down, which, in fact, is of itself in many places giving way. The wall of the outer fort commences within 200 paces to the southward of the north-east angle, along the east face of the inner fort, and runs in an irregular line, with bastions and one gate, in a south-50-easterly direction, and ends in an angle within 300 yards of the river; it then takes a southerly direction, having one gate about 100 yards from the bastion. Thus far it is of brick, it continues to some distance in the above line, then gradually runs in an easterly direction, and ends in a high bastion to the south-westward; the distance from this to the south-west bastion of the inner fort is about 450 paces, and to it it runs due north. From the gate near the north-east angle is a stockade of wood, having along its southern face three gates, with bricked bastions, the centre one being the principal entrance, from which a raised road runs to the village of Táwang tan [ท่าวังตาล], on the Me Ping [แม่น้ำปิง]. The outer fort is likewise surrounded by a broad ditch; part of it to the southward and eastward is now dry, and, when full, must be about eight feet deep; along its north-eastern face it has a swamp and large tank, from which the ditch is fed. One main street runs from the gate near the north-east bastion of the exterior fort to the gate in the eastern face of the main fort. From this gate again, a road runs to the opposite gate in the western face; about half way between these gates a road runs at right angles to the northward, to the White Elephant Gate [ประตูช้างเผือก] in that face, and also one to the southward (inclining a little to the eastward), about half way between the cross roads and western gate; another road runs to the other gate in the southern face of the fort. The outer fort is not in some parts inhabited, being swampy; it is the residence principally of the Kiang Túng [Kengtung / เชียงตุง / ၵဵင်းတုင်], Kiang Then [Chiang Saen / เชียงแสน], and other Tsóbuas [เจ้าฟ้า], with their followers. The inner fort is abundantly watered by watercourses intersecting it in all directions, the water being brought from the hill, entering the ditch and fort at the northwest angle. There is a tolerable bazar here in the outer fort, along the main street, kept by women; small sheds are erected along each side of the road, in which they display their goods. The fresh meat sold here is pork, and occasionally beef, both slaughtered by Chinamen: dried fish and meat are brought from the northward from Kiang Then [Chiang Saen / เชียงแสน], and along the road to Kiang Túng [Kengtung / เชียงตุง / ၵဵင်းတုင်], the country in that direction being intersected by numerous rivers and streams swarming with fish, and the woods abounding with deer, &c.
With reference to the trade here, there is but little demand for our goods, the shani, a red cotton stuff, is the only thing in request, and that even does not fetch its prime cost. Our traders exchange it for cattle, and make some profit by taking them to Moulmein [မတ်မလီု ]. Though all our piece goods are admired, yet from the Tsóbua [เจ้าฟ้า] downwards they have no inclination to part with their money; and if anything foreign is seen in their possession, one may be pretty certain it has been given to them. In fact, if it were not for the cattle procured here none of our traders would visit the place. 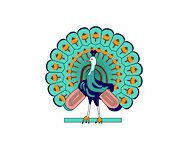 The exports consist of grain, teak wood, stick lack, tobacco, palm sugar, and safflower, &c., to the Lower Provinces. From Bangkok, they get in return a small quantity of salt, chintz [چھیٹ], China crapes and China ware. They carry out to the Kareng [กะเหรี่ยง] villages iron (procured from the Lawas [ละว้า / ລະວ້າ]), salt, and hatchets, &c., which they barter for cloths, onions, chillies, wax, and cotton. To the Red Kareng [Karenni] country they export cattle, and procure in return slaves, ponies, and stick lack. By the Chinese they are supplied with copper and iron pots, tinsel, lace, gold thread (of a very bad description, of which they use a great deal for the embroidery of pillows, dresses, &c.), silk, chiefly raw, and a little gold; and in return give cotton, ivory, rhinoceros and deer horns, dried shrimps, birds’ feathers, all but the first obtained partly from our provinces. There are about 20 Chinese settled here, who act as agents for others. The caravans generally to this place and Labong [= Lamphun / หละปูน / ลำพูน.] consist of about 300 mules. I must not fail to mention that quantities of betel nut, with which these territories abound, are smuggled for sale to Kiang Túng [Kengtung / เชียงตุง / ၵဵင်းတုင်], where there is none, and the consumption great. It is a profitable trade, and the authorities must be aware of it. Women are seen weaving in every house, either white cloth of a coarse texture, or silk putcho (men’s cloths), and tamiens (women’s petticoats) of cotton or silk, the former the produce of the country, and also some of the latter. lower classes. The jackets of the chiefs are either of white cloth or China silk; those of the common people sometimes of blue, with a border of tinsel. They smoke tobacco generally in pipes, but both men and women chew betel to an excessive and disgusting extent; they are never to be seen with their mouths empty; their teeth are particularly black, which they consider a beauty; even young children are taught the dirty practice when they can just walk. A bag into which the betel apparatus, &c., are put, forms an essential part of a man’s equipment; it is slung over his shoulder, and he is never to be seen without it. The dress of the women consists of the petticoat made of coarse silk, with a worked border in silk and gold thread, or of common cotton of party colours, not open in the front like the Burmese ones; it is kept up merely by a twist below their breasts; a jacket of pink, or a very dark blue cloth, made and dyed by themselves (the deep colour of which particularly struck me) with a tinsel border or edging is carried, not to be worn, but thrown loosely over their shoulders, with which alone they sometimes partially conceal their breasts. Their hair, which is long, is tastefully tied in a knot on the crown of their heads, and the only ornaments used are a gold chain twisted round their hair, a gold pin stuck through it, and gold bracelets; few wore earrings. The chiefs are, generally speaking, very fine looking men, and differ in appearance from the common people; they are tall, fair, have good noses, and light eyes. The other men generally are tall, stout, hardy, and active. The women are also tall, and remarkably well-proportioned and very fair, and a handsome race, but their mouths are disfigured by the use of betel, and many are subject to goitre. The children are particularly fair, generally with light eyes and the hair having a slight tinge of red. Every man, as I have said before, is considered the follower of some chief; besides what he furnishes to his immediate superior, he pays to Government three baskets and five pi [ပြည် / 2,56 Liter] of paddy for each buffalo and plough as a tax; this is stored for public purposes. A duty of one viss [ပိဿာ / 1.63 kg] for each basket of seed sown is collected on cotton. 2 viss of tobacco for every 1,000 plants. 2 viss of safflower 1,000 ditto. Betel, 144 strings, or 288 nuts (for here the nut is cut into 10 or 12 slices, and run on a string and left to dry) for a plantation, however small or large. Chilly, one viss for a garden. Salt, 20 viss for a boat-load from Bankok. The above are divided, with the exception of the grain, in the following proportions: The person employed in collecting receives one-fourth, the Tsóbua [เจ้าฟ้า], the Chou Hona [เจ้าหอหน้า] and the Chou Raja Wun [เจ้าราชวงศ์], and the master of the village one-fourth each [of the remainder]; others again told me that the Tsobua, Chou Hona, got one-third each (the Chou Raja Wun sometimes shares with the latter), and the remaining one-third is divided between the master of the village and petty officers. A division of the country with respect to this tax has lately been made, the villages on the left bank of the Me Ping, above the village of Táwang tan [ท่าวังตาล], are to pay to the Chou Hona; those below that village to the Chou Raja Wun, and all on the right side of the Me Ping [แม่น้ำปิง] to pay to the Tsóbua [เจ้าฟ้า]. Every person catching an elephant, should he dispose of it, gives his immediate chief 30 per cent; the same on ivory; but should he be very successful and catch 10 or 20, the master, after taking care of himself, presents one to the Tsóbua [เจ้าฟ้า], and one to the Chou Hona. These animals are caught to the southward of this, about the Thoung Yin [ตองยิน], and in our territories; a few only are found to the northward. The principal emoluments of the chiefs arise from their own fields, the little trade they carry on, and the presents they receive. The people appear to me to be less oppressed by the Government than the Burmans, and not subject to the payments and heavy demands levied in that country. The teak forests, which extend beyond this, as well as on the Thoung Yin [ตองยิน], Me Nium [แม่ยวม] and Salween [သံလွင်မြစ်], are the property of the chiefs. They generally allow people to cut, by paying them 10 per cent. The forests on the Thoung Yin [ตองยิน] and Me Nium [แม่ยวม] belong to Chou Hona [เจ้าหอหน้า], who has given people permission to cut there, and some wood from them has already been taken to Moulmein [မတ်မလီု ]. The Chou Raja Wun [เจ้าราชวงศ์], to whom those on the Salween [သံလွင်မြစ်] belong, refuses to permit any person making use of the wood until he goes to Bangkok and obtains the king’s sanction. The wood on all these rivers are perfectly useless to the Shans [တႆး], there being no possible means of conveying it to any of their towns. The boats made to navigate the river here are formed of one tree, opened out until nearly flat, and a broad plank is added to each side; not a nail is used in the whole of their construction; the bottom is generally of thengan [Hopea spp. ], and the sides of teak. Their general length is about 60 feet, and only six broad; they carry 300 or 400 baskets, and sell for 120 Siamese ticals, and a duty of 10 per cent on the price is collected on them. The rupee is current here as well as the Siamese tical (the round coin), but the money most in circulation is coarse silver of about 80 per cent, alloy, I believe, melted into a circular form, in which a hollow is formed by blowing when hot; the bottom of this cup is so fine that it is apt to break; when this occurs, or when it is cut, the value is much deteriorated. It bears a small mark or stamp made by the court officers (by whom it is issued) on the edge. Of this description there are two sorts of equal alloy, but one twice the size of the other. One hundred ticals are given for 45 Madras rupees, but these are only equal to 75 Burmese ticals. They use the same weights and measures as the Burmans, but deteriorated one-fourth, or 25 per cent. The owner of each house is supposed to have a musket, and certainly no Shan [တႆး] is met beyond the town travelling without one. Each chief may be called upon to supply, at the utmost, two-thirds of his followers during any war, these are obliged to supply themselves with provisions and carriage. Their own chiefs furnish at the rate of one elephant to five men; if the campaign is a distant one, Government occasionally gives an elephant. Two men can be exempted from going by supplying an elephant for the public service. Each man is furnished with one viss [ပိဿာ / 1.63 kg] of powder and 50 balls from the stores, and should he not possess a musket one is lent him. Some are also armed with spears and swords. Elephants alone are used for the transport of an army, and of these there are a great number in all the Siamese Shan towns. One branch of the army consists of elephants trained to carry two jingals and four men each, but these are never fired over the animal’s head; he is made to turn his tail to the enemy before they are discharged. From the materials with which their army is constructed, it can only be expected to be an undisciplined mob. The Shans are considered adepts at lying in ambuscades and for night attacks. They certainly are quick of sight and hearing, and creep through the forests in a surprising and quiet way; their constant life in the woods in search of game gives them this advantage. All their attacks on their neighbours’ villages have been made at night. They never wait to make a regular attack or fight by day; if they fail in their attempt, they retreat and watch a more favourable opportunity. They are not, I should say, a brave race, but boast exceedingly of their victories over the Burmans, and consider one of themselves as equal to 10 Burmans. They are hardy and capable of undergoing fatigue. A little of the glutinous rice cooked at night, and tightly pressed into a small basket, which they carry tied round their waists, and out of which they eat at all times (using no plates or wooden dishes) with a little dried fish or meat, or a few herbs and salt, affords them an ample and hearty repast; but when at home they consume large quantities of spirits; but their food in other respect is not much better than what I have mentioned above. Before daylight every day I am awakened by the noise of the bells attached to the bullocks. These animals are employed the whole day in bringing in the grain, following each other in a regular unbroken line, the leaders decked out with peacocks’ feathers, and various ornaments, as a sort of mark. Strings of elephants are also seen conveying the same article, as well as bringing in thatch, and pulling along bamboos, and timber, and performing all sorts of work. The number in this province is said to exceed 1,000. I am in a noisy neighbourhood, between the bridge and gate, where at least half a dozen spirit shops are erected; and the elephants bringing in the grain stop at each by instinct to enable his rider to take a glass, for which he throws down a little paddy. The scenes of drunkenness are excessive, and I really never saw it exceeded anywhere. An elephant can be hired for from 10 to 15 ticals a month, whilst the woodcutters in our provinces pay, I believe, 5 rupees a day for one. Carts are also used, but instead of yoking oxen to them, they are pulled and pushed along chiefly by the women. Their construction is good, and the whole very much resembling an English one. The Siamese Shans are not a social race; they have no amusements amongst them; instead of seeing them like the Burmans, after the day work is over, playing at football, and jumping about, singing, &c., every person returns to his house, and everything is perfectly quiet early in the evening. Their muskets are generally of all countries, English, French, &c.; very old and dangerous to fire. Muskets are now made here, chiefly by the Lawas, but they prefer an English one, however bad it may be. Lately great numbers have been imported from Bankok, apparently of Chinese manufacture, and sold there for eight or ten ticals each. They prize an English gun-lock greatly. I was furnished by various individuals with accounts of the population and number of available men in the different provinces to carry arms; these did not vary much. 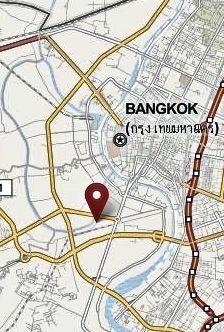 I give an average below; a census was attempted to be taken during the reign of Chou Tsati [เจ้าชาติ] (, the former Tsóbua [เจ้าฟ้า] of this place (the present Chou Raja Wun’s [[เจ้าราชวงศ์]] father), but was not completed. The number of men able to bear arms amounted in the southern districts to 5,000, under 300 Thuggis or heads of villages, but they are said to exceed that number in the eastern, and northern, and to be less in the westerndistricts. The Kiang Tung [Kengtung / เชียงตุง / ၵဵင်းတုင်], Muang Niong [เมึองยอง], and people from other States now residing in the territory are included in the statement. I should think that the number of houses in Zimmé [Chiang Mai /เชียงใหม่] far exceed that put down, but the person assured me he had, at my express request, extracted it from the public records; that the number of houses registered in the whole province [sic] is 7,000; this he took from the list made for levying the money for the celebration of the festival of the guardian Nat [နတ်‌], or spirit of the place, and could be depended on. This would give the population mentioned, allowing a fraction more than seven to each house, which here contain more inhabitants than those in Ava [အင်းဝမြို့]. I should say that the number stated far exceeds the population in the province, but that the town contains more than is put down. The tribute paid by these States to Bangkok consists almost entirely of teak wood; the quantity I am told is not fixed, nor is the period of payment regular. Sometimes it is not sent for two years, at others annually. It consists generally of 250 trees of five fathoms in length and two feet in diameter. The other provinces pay in the same proportion with reference to their size. Sometimes, however, when elephants or wood are required by the king, a civil message is sent up intimating his wants, which are of course supplied. Dr. Richardson has already given an historical sketch of the Tsóbua [เจ้าฟ้า], or kings of Zimmé [Chiang Mai /เชียงใหม่], &c.
The inhabitants do not apply the term Lau [ລາວ / ลาว] to themselves; they consider Laos or Lau, lying on the eastern bank of the Me Khong [Mekong / ແມ່ນ້ຳຂອງ / แม่น้ำโขง] or Cambodia River, and Muang Luang Phaban [Luang Prabang / ຫຼວງພະບາງ], or Lantchiang [ล้านช้าง / ລ້ານຊ້າງ] (called by the Burmese Maing Lon Kaban, or Lenzeng) the capital; some, however, include Chandapuri[ຈັນທະບູລີ], Muang Tchiang [Vientiane / ວຽງຈັນ], or Win Tchiang [Vientiane / ວຽງຈັນ] (Elephant City, from the number found there) within this kingdom; others make it a separate one, formerly ruled by a king of its own. Likewise Lan [ລ້ານ] means a million Tchang [ຊ້າງ] elephants. The Siamese, I am told, call the inhabitants of Zimmé [เชียงใหม่], &c. Thai Noi [ไทยน้อย], or the common people, Bau Thai [บ่าวไทย], and the chiefs Puniah Kiang Mai [พญาเชียงใหม่]. They also call them Lau Phung Dam [ลาวพุงดำ], or Black-bellied Lau, and the inhabitants of Muang Luang Phaban [Luang Prabang / ຫຼວງພະບາງ], and Win Tchiang [Vientiane / ວຽງຈັນ], Lau Phung Ham [ลาวพุง?? ], or White-bellied Lau. These appellations have been given in consequence of the former being in the habit of tattooing their limbs and continuing it in a particular form over one side of the belly, while the latter, like the Siamese themselves, do not in any manner disfigure themselves. This shows that the Siamese consider Zimmé [เชียงใหม่] as a part of Lau [ลาว] or Laos, by applying the term Lau to both the inhabitants of the eastern and western sides of the Me Khong [Mekong / ແມ່ນ້ຳຂອງ / แม่น้ำโขง], or Cambodia River. This may, however, have originated from Zimmé having been once subdued by and tributary to Laos. They do not understand the term Yun, as applied to this part of the country by our geographers. They assert that that country is to the eastward. The Burmans, I believe, call Cochin China, Yun gyi; may not this have led to the appellation being given to the country immediately to the eastward of the Salween [သံလွင်မြစ်]? The Burmans are called Mán [ม่าน]. The Talains [Mon] Meng [เมง]. The Siamese Chou Tai [เจ้าใต้]. The inhabitants of Win Tchiang [Vientiane / ວຽງຈັນ] and Muang Luang Phaban [Luang Prabang / ຫຼວງພະບາງ] Laú [ลาว]. The inhabitants of Kiang Túng [Kengtung / เชียงตุง / ၵဵင်းတုင်] Khian [เขิน]. The inhabitants of Kiang Húng [เชียงหุ่ง / เชียงรุ่ง / Chiang Rung] Li [ลึ้อ]. The inhabitants of Muang Niong [เมึองยอง] Li [ลึ้อ]. The inhabitants of Muang Lem [เมึองแลม / Muang Laem] Lem [แลม]. The inhabitants of China Hau [ฮ่อ / Hó]. The inhabitants of Cochin China Min and Kio [แกว]. The Karengs [ကညီကလုာ် / กะเหรี่ยง / Karen] Niang [ญาง]. Win Tchiang [Vientiane / ວຽງຈັນ] was taken about 10 years ago and destroyed; most of the inhabitants were removed to Bangkok. It is situated on the western bank of the Me Khong [Mekong / ແມ່ນ້ຳຂອງ / แม่น้ำโขง] below Muang Luang Phaban [Luang Prabang / ຫຼວງພະບາງ] ; Chandapuri [ຈັນທະບູລີ] is on the eastern bank opposite it, but they are considered as one city, and the names indiscriminately used for either or both. The town on the eastern bank is described as being very strong, surrounded by a fort, with a large stream flowing on its northern, and another stream partly on its eastern side, with a swamp towards the eastern and southern sides, backed by high hills. It was at the time of its destruction tributary to Siam, but paid a triennial tribute to Cochin China. The Tsobua [เจ้าฟ้า] of the place was inclined to throw off his dependence on both countries, having made proposition to the ruler of this place to join, and together to declare their independence, which led to its overthrow. Muang Luang Phaban [Luang Prabang / ຫຼວງພະບາງ], though a Siamese province, pays triennial tribute to the Cochin Chinese, the enemy of their immediate masters, and between whom a war is raging at present. It likewise sends two elephants every eight years, as a mark of submission to China. The town is described as being on the eastern bank of the Me Khong [Mekong / ແມ່ນ້ຳຂອງ / แม่น้ำโขง], surrounded by a fort with a fortified hill in its centre. On its eastern side are high and impassable mountains; on its northern side is a river, which also washes part of the eastern face. The Me Khong flows to the westward, and it is only open to the southward. It was governed by a Tsobua [เจ้าฟ้า], who lately died, and it is supposed his son will succeed him. Zimmé [เชียงใหม่] and all the country in this direction formerly belonged to the Lawas [ละว้า / ລະວ້າ], who are now but few in this district; some are found in about six villages to the northward, beside those near Muang Niong [เมึองยอง]; the rest have fled to the mountains round Kiang Túng [Kengtung / เชียงตุง / ၵဵင်းတုင်], which country, however, is said also formerly to have belonged to them. It was also subject to the Lau [ລາວ / ลาว] prior to its conquest by Ava [အင်းဝမြို့]. It carried on war with both Ava and Siam at the same time, and eventually was conquered by the former; rebelled against it, and placed itself under the protection of Siam. The kingdom of Kiang Mai [เชียงใหม่] comprised 57 cities, mentioned in the Burmese books as 57 Kraings (corruption, I suppose, for Kiang [เชียง], a fortified or walled city), many of which at present exist, or their ruins can be traced. 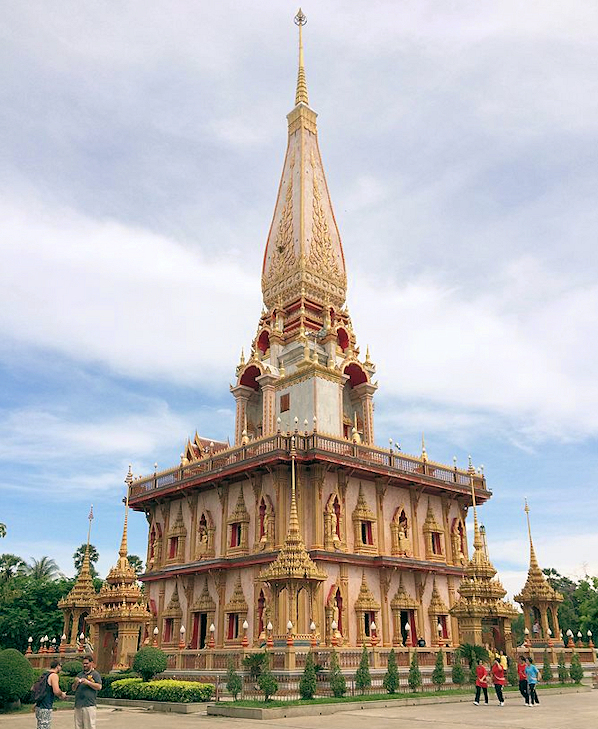 Muang Nan [เมืองน่าน] and Muang Phé [เมืองแป้ / เมืองแพร่ / Phrae] were included in the number, and the capital was both Kiang Mai [เชียงใหม่] and Kiang Hai [เจียงฮาย / เชียงราย / Chiang Rai], a place to the northward on the Me Khok [แม่น้ำกก]. It extended from the Me Khong [Mekong / ແມ່ນ້ຳຂອງ / แม่น้ำโขง](Cambodia river) to the Me Khong (the Salween [သံလွင်မြစ်]) east and west. To the northward it was bounded by the territories of Khiang Tsen [เชียงแสน / Chiang Saen] and Kiang Túng [Kengtung / เชียงตุง / ၵဵင်းတုင်], which extended to the Me Khok [แม่น้ำกก]; to the southward by the territories of Muang Kam peng [เมืองกำแพง / กำแพงเพชร / Khamphaeng Phet], belonging to Siam. Its boundary is at present undefined to the northward, but the Me Tsai [แม่สาย / Mae Sai] is sometimes mentioned as forming it. 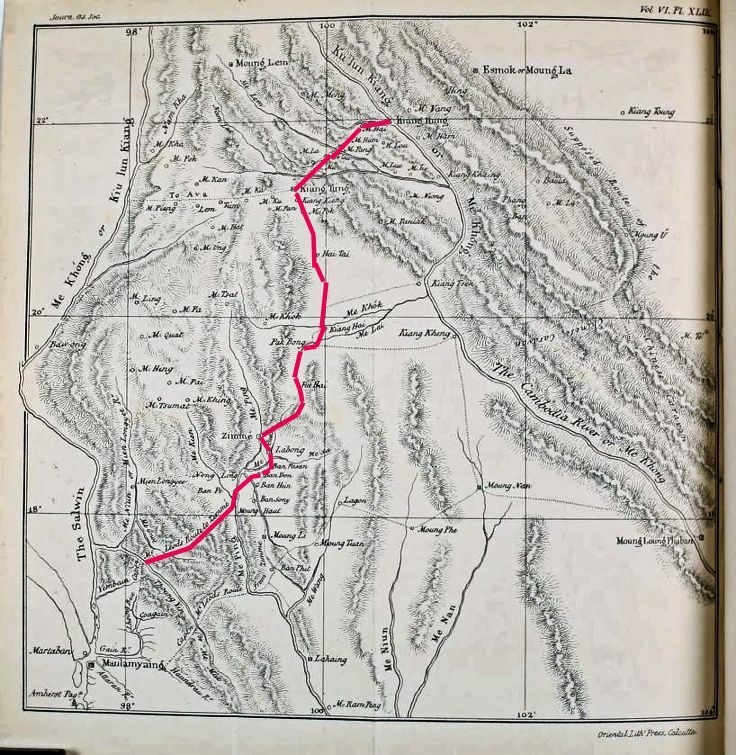 To the westward it extends to the Salween [သံလွင်မြစ်], to the eastward to the hills bounding the valley of the Me Ping [แม่น้ำปิง]; to the southward, on the left or eastern bank of the Me Ping, to the village of Patapa [ประตูป่า / Pratu Pa]; and on the right, or western bank, to the Me Gnau [แม่เงา / Mae Ngao], or by some accounts to the Me Tian, to the southward of which the territories of Lahaing or Yahaing [ละแหง / ตาก / Tak] commence. Lagong or Lacon [ละคอน / ลำปาง / Lampang] has Muang Phe [เมืองแป้ / เมืองแพร่ / Phrae] to the eastward; to the northward its jurisdiction runs up as far as those of Labong [Lamphun / หละปูน / ลำพูน] and Zimmé [เชียงใหม่]; that to the southward, I could not exactly ascertain, but not further than that of Labong. I am unable to obtain satisfactorily the boundaries of Muang Phé [เมืองแป้ / เมืองแพร่ / Phrae] and Muang Nan [เมืองน่าน] to the southward; the former is but a small territory. 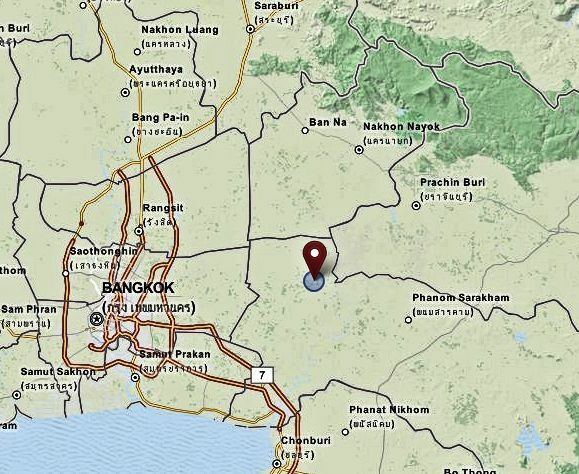 The latter is as far as Kiang Khong [เชียงของ] only confined to the western bank of the Me Khong [Mekong / ແມ່ນ້ຳຂອງ / แม่น้ำโขง], but beyond which it is said to have a strip of country on the eastern bank towards the Kiang Túng [Kengtung / เชียงตุง / ၵဵင်းတုင်] territories. Muang Luang Phaban [Luang Prabang / ຫຼວງພະບາງ] extends to the southward to the province of Chandapuri [ຈັນທະບູລີ] or Win Tchiang [Vientiane / ວຽງຈັນ], to the northward it is bounded by that of Kiang Hung [เชียงหุ่ง / เชียงรุ่ง / Chiang Rung]. The ignorance and indifference shown here almost by all respecting the territories, &c., &c., of the neighbouring States is incredible; few could tell me whether the Tsobua [เจ้าฟ้า] of Muang Nan [เมืองน่าน] was dead or not. They do not even trouble themselves much to make themselves acquainted with what more immediately concerns themselves. Zimmé [Chiang Mai /เชียงใหม่], Labong [Lamphun / หละปูน / ลำพูน], and Lagong [ละคอน / Lampang / ลำปาง] form the patrimony of one family, all the chiefs being connected. The oldest chief who generally resides at Zimmé, has a sort of controlling authority over the others; more in their external relations than internal government; much jealousy, however, exists amongst them. Muang Phe [เมืองแป้ / เมืองแพร่ / Phrae] and Muang Nan [เมืองน่าน] stand in the same relation to each other as the others." 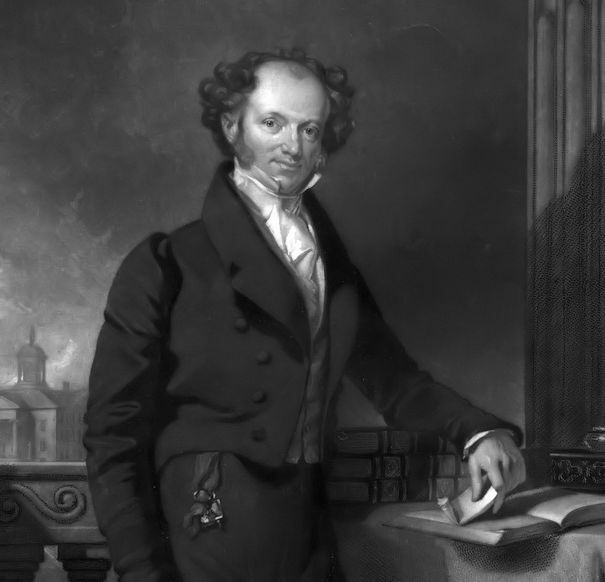 Martin Van Buren (1782 - 1862) ist Präsident der USA. Tharrawaddy Min (သာယာဝတီမင်း, 1787 - 1846) ist König von Burma. Feuersbrunst auf einem kleinen Markt in Thonburi (ธนบุรี). Der US-Baptisten-Missionar William Dean (1807 - 1895) baut in Bangkok die erste protestantische Kirche in Siam. 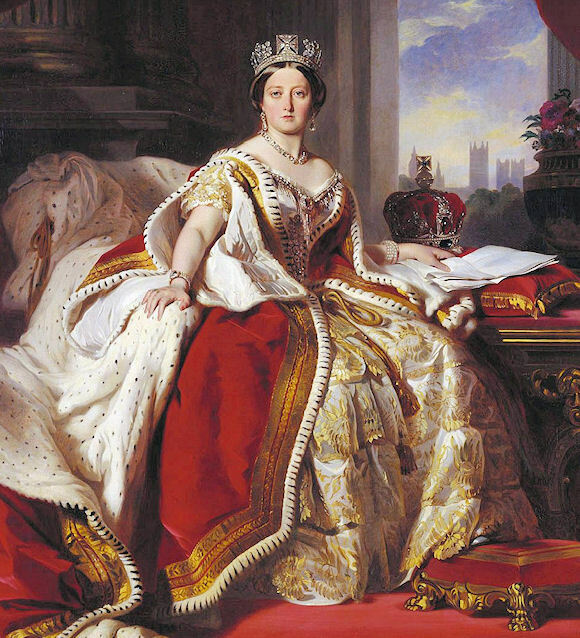 Victoria (1819 - 1901) ist Königin des Vereinigten Königreichs von Großbritannien und Irland. "Viktorĭa Alexandrina, Königin von Großbritannien und Irland, geb. 24. Mai 1819 in London, gest. 22. Jan. 1901 in Osborne, einzige Tochter des Herzogs von Kent, des Bruders König Wilhelms IV. (gest. 23. Jan 1820), und der Prinzessin Luise Viktoria von Sachsen-Koburg, verwitweten Fürstin von Leiningen (gest. 16. März 1861), ward durch den Tod ihres Vaters Erbin des britischen Thrones. Unter der Leitung der Herzogin von Northumberland ward sie in ernstem Studium für ihren künftigen Beruf erzogen; Lord Melbourne trug ihr vom Standpunkte der Whigs aus das englische Staatsrecht, Geschichte und die englische Regierungspraxis vor. Als Wilhelm IV. 20. Juni 1837 starb, ward Victoria als Königin ausgerufen und 28. Juni 1838 gekrönt. Unter den vielen Freiern um ihre Hand bevorzugte sie, der Neigung ihres Herzens folgend, den Prinzen Albert von Sachsen-Koburg (s. ð Albert 7), mit dem sie sich 10. Febr. 1840 vermählte. Ihre Regierung begann mit einem Whigministerium, und nur ungern entließ sie ihre freisinnigen Ratgeber, als diese die Mehrheit im Unterhaus verloren. Doch fügte sie sich williger als irgend ein englischer Herrscher vor ihr den Anforderungen des streng parlamentarischen Regierungssystems und willigte sogar nach anfänglichem Widerstreben darin ein, auch die ersten von Damen bekleideten Hofämter dem Wechsel der Parteien im Ministerium zu unterwerfen. Ungeachtet dieser Gefügigkeit nahm indessen die Königin an der Regierung des Landes und namentlich an der auswärtigen Politik stets einen lebhaften, wenn auch nicht immer deutlich erkennbaren Anteil, während sie sich nach dem Tode ihres Gemahls (14. Dez. 1861), den sie tief betrauerte, den Pflichten der äußern Repräsentation mehr und mehr entzog und diese auf den Prinzen von Wales übertrug. 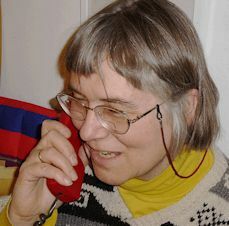 Solange Prinz Albert lebte, ward ihr Einfluß in deutschfreundlichem Sinne geltend gemacht und hinderte z. B. die Einmischung Englands in den Deutsch-dänischen Krieg von 1848. Ihr Wunsch bewog Disraeli 1876, ein Gesetz vorzuschlagen, durch das ihr die Ermächtigung erteilt wurde, sich den Titel: »Empress of India« (Kaiserin von Indien) beizulegen, den sie durch Proklamation vom 1. Mai annahm. Überhaupt stimmten die Neigungen der im Anfang ihrer Regierung entschieden whiggistischen Königin später, namentlich seit dem Erstarken des Radikalismus, mehr mit den Grundsätzen der konservativen Partei und namentlich des von ihr zum Grafen von Beaconsfield erhobenen Disraeli überein. Unter großen Festlichkeiten und mit hohem Glanz feierte sie 21. Juni 1887 ihr 50jähriges, mit noch größerm 22. Juni 1897 ihr 60jähriges Regierungsjubiläum. Sie hat eine längere Regierungszeit als irgend ein englischer Herrscher vor ihr erreicht, und ihr Tod ward von dem englischen Volk allgemein und tief betrauert. Ihr Leichnam wurde 4. Febr. 1901 in dem Mausoleum zu Frogmore an der Seite ihres Gemahls beigesetzt. Aus ihrer Ehe entsprangen neun Kinder." Die Fregatte von Rama III., "Conqueror", läuft in Singapur ein. "Siam. The Singapore Free Press of 27th of July, notices the arrival at that port of his Siamese majesty's frigate 'Conqueror', a vessel of 600 tons, just launched from the decks at Chántibun [Chantaburi - จันทบุรี]. She is armed with forty guns, of what calibre is niot said ; but notwithstanding her warlike equipment and name, she is at present to be employed only as a peaceful carrier of the goods of his golden footed majesty's subjects. Another vessel of 1000 tons has been laid down, and is to be similarly equipped and employed. 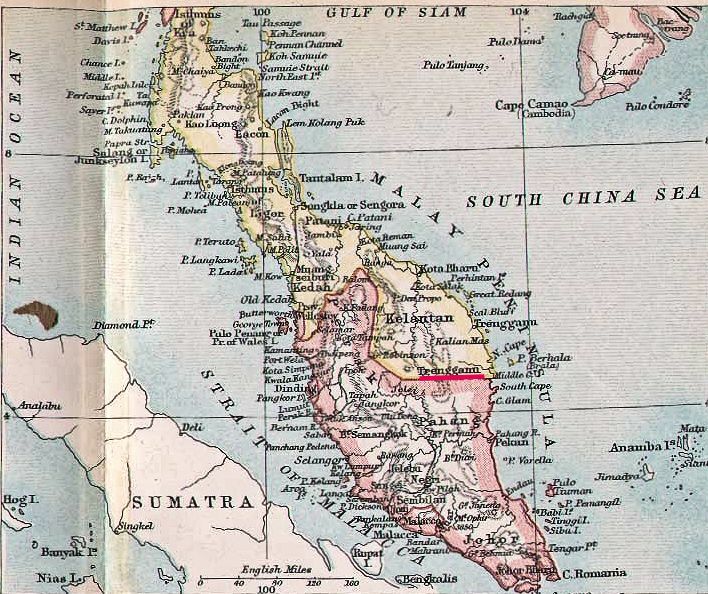 The Malay pirates, expelled by the vessels of his Britannic majesty, from the immediate neighbourhood of Singapore have taken refuge in the northern part of the gulf of Siam. War boats have been dispatched against them by the Siamese government, but, as may be supposed, to no purpose -- neither party having any desire for too near a contact. It is said that the king has directed the phrákláng, or foreign minister, to adress the Straits government on the subject, requesting their aid in extirpating the pirates. We are glad to find so haughty a potentate as the Siáyuthayan monarch entering into an unsought communication with a subordinate European government." 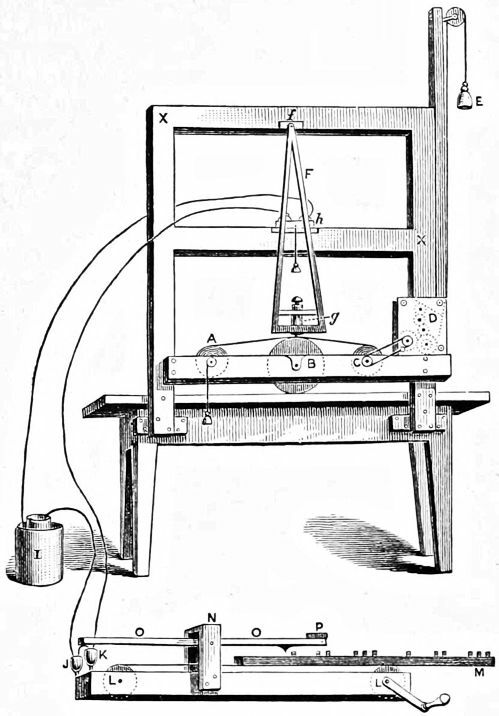 Der Amerikaner Samuel F. B. Morse (1791 - 1872) führt erstmals den nach ihm benannten Schreibtelegraphen (Morseapparat) vor.